I love baking for my friends and family especially during Christmas. It's my way of showing appreciation and saying "Thank You" to all who have been through with me during the tough and rewarding 2017. These are part of the lovely Christmas gifts that I have baked for my colleagues. 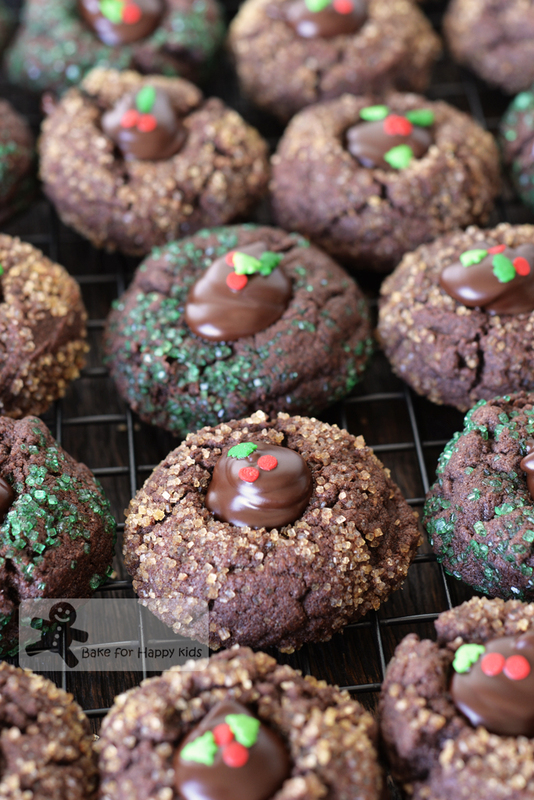 Do you want to munch on these yummy Christmasy rich fudgy buttery chocolate peppermint cookies? If your answer is YES, I'm sorry to tell you that I won't bake for you... unless you are my family, friends or colleagues! LOL! If you want to eat these cookies, you have to bake these cookies! And it's easy! Here's a video showing how I baked these yummy cookies and I believe that you can bake them very well too. Yes but only two! And they are very critical!!! Please do not reduce the amount of sugar added! And do not omit the sugar coating! These cocoa-loaded cookies are a little bittersweet and yet very rich in its chocolaty flavours. Thus, they need adequate amount of added sugar to balance their rich chocolaty flavours and need the sugary crunchy coating to make every munch of these fudgy cookies a perfect multi-dimensional texture. Please do not over-bake cookies! Not more than 10 minutes in total!!! 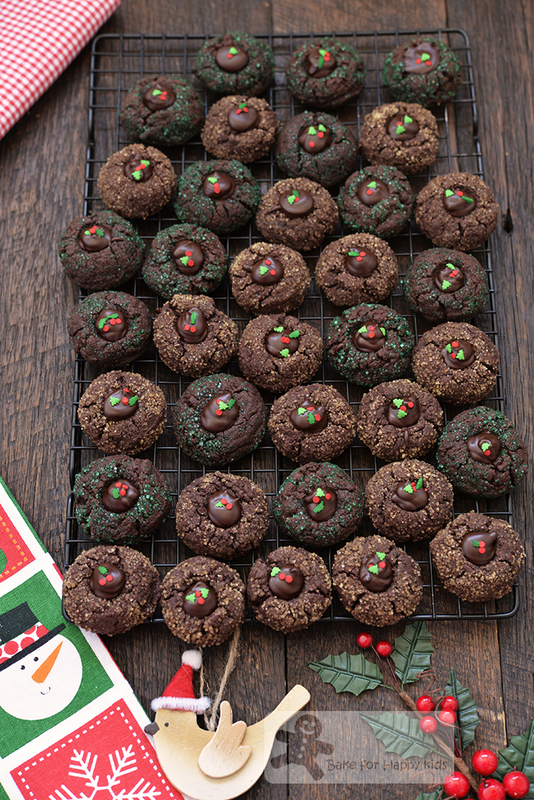 These cookies are meant to be moist and fudgy and over-baking them will make them too dry and literally hard to eat! To make these cookies looking Christmassy, I have coated some cookies with green coloured sugar. And decorated all with Christmas sprinkles. I hope that you will try baking these lovely cookies and like my easy Christmas recipes. 200g (1 cup) caster sugar - Do not reduce this amount! 100g (1/2 cup) demerara or any coarse white / coloured sugar - Do not omit this! *Due to the fact that these slight bittersweet cookies are already rich in cocoa flavours, I prefer to use semi-sweet dark chocolate to make the cookie filling a little more subtly sweet. Using a wooden spoon or an electric mixer with paddle attachment, beat butter and sugar for about 2-3 mins or until fluffy. Add egg bit by bit and beat well after each addition. Add vanilla and beat until combined. Sift flour, cocoa powder, baking powder and salt into the butter mixture. Use a spoon or spatula to mix until mixture is just combined and forms a soft dough. Scoop or roll tablespoonfuls of dough into balls, then roll in demerara or coarse sugar to coat. Arrange the sugar-coated cookie dough on the prepared tray with about 5 cm / 2 inches apart. Bake 5 mins. Remove cookies from oven and use a small round spoon to make an indentation in center of each cookie. Bake again for about 5 mins or until cookies are just set. Do not over-bake. Allow cookies to cool slightly for about 10 mins on the baking tray. Then, transfer them onto a wire rack to cool completely. Add butter and dark chocolate in a heat-proof bowl and use a microwave with low power or a pot of simmering water to melt the chocolate-butter mixture. Allow chocolate to cool slightly and stir in peppermint extract. When the chocolate is thick enough to pipe, transfer mixture to a large zip-top bag and pipe a dollop of chocolate into each cookie indentation. 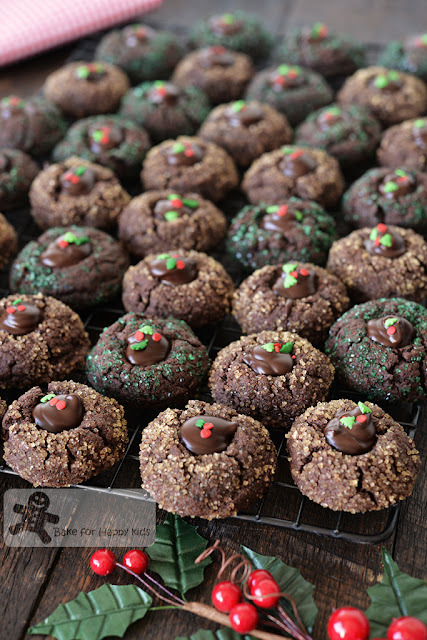 Decorate the chocolate area of the cookies with sprinkles if desired. Allow chocolate to set. Serve or store cookies in an airtight container at room temperature for up to 1 week.